On Hollywood Road in Hong Kong's Central near Lyndhurst Terrace, where the street has shaken off the last remnants of the lively bar and nightlife scene along Wyndham Street to segue into a respectable and classy antique zone. 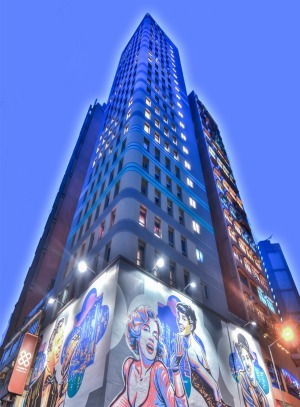 Tall and slim as a supermodel, the hotel has just two suites on each of its 27 floors. The reception is shoebox-small and so anonymous you might walk past but look up, there's no missing the giant mural depicting Charlie Chaplin, Marilyn Monroe and Audrey Hepburn. The red velvet lifts are a hint of things to come. The "Hollywood" in the name is another clue. This is one hotel that takes its design cues from the stage, although comfort is the main priority. As a boutique hotel, facilities are throttled back. There is a well equipped gym and a lounge, neither of which sees much trade. The smaller of the two suites on each floor is 54 square metres, which is oodles of room for two. The larger is 70 square metres. Each suite has a big separate lounge room with a kitchenette, a comfy couch and a curved widescreen TV with another flat screen version in the bedroom. Hanging space and stowage space are abundant. 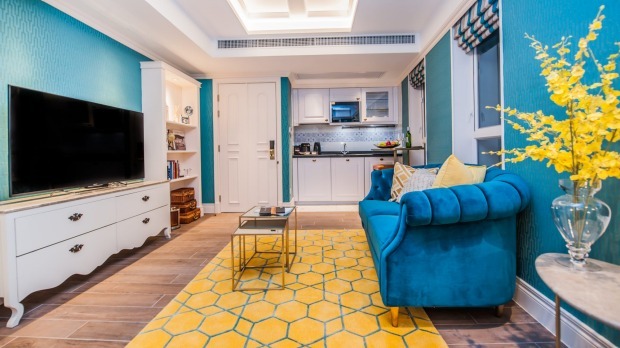 Signature Chaplin and Monroe suites come with extra razzle dazzle but there is nothing standard about the plush standard suites with their tutti-frutti decor. Beds are worthy of movie star bodies and crisply sheeted. Lighting is brilliant, bathrooms are shower only but they're big and bright. There is also a washer-dryer machine, an iron and ironing board. Every room comes with a Handy phone, a smartphone that you can tote around with you for free local and international calls and best of all, a Wi-Fi hot spot right in your pocket. No need to swap your SIM card, or fret over finding a free Wi-Fi hookup. No dining on the premises but this is Hong Kong Central. Within a five-minute stroll there are probably 50 dining options, from coffee bars to dai pai dong street food to Michelin-star fine dining, smart and sassy tapas bars to tea shops, and the venerable Lan Fong Yuen tea stall is just around the corner. Aussie-owned Peel Street Cafe, which does the best espressos in Hong Kong and breakfast comfort food, morphing to a wine bar by night, is a two-minute stroll. On your doorstep you have Hong Kong's finest antique shops along Hollywood Road, with treasures from Ming to Mao. Spilling down along Graham Street is a lively food market stacked with fruit and vegetables and the inscrutable fungi of the Chinese table. Further along Hollywood Road the Police Married Quarters, the hot new designer HQ packed with small boutiques with judicious collections of homewares, fashions and accessories. Lower down and just off Hollywood Road is the Cat Street Thieves Market, Hong Kong's favourite street market with a strong line in Mao-era repros. There is another smart shopping district close by in PoHo and the never-say-goodnight Wyndham Street nightlife scene lies within staggering distance. The closest MTR Station is Central, about a 10-minute walk, with speedy connections throughout most of the interesting bits of Hong Kong and Kowloon. Tired and footsore from a day on the streets? Let the mid-levels escalator hoist you back up the hill from Queen Street and you're just a two-minute, flat-earth walk from the Madera. Rooms this size are a big bonus in squeezy Hong Kong. Quiet, soothing and in a prime position, the Madera Hollywood injects panache and a generous serving of style into any Hong Kong stay.